The newest sequel of stone-puzzle game like Bejeweled and Diamond Mine! Genuine HEX 9*9 board brings remarkable charm of novelty. Be concurrently attentive and fast playing this remarkable puzzle game. 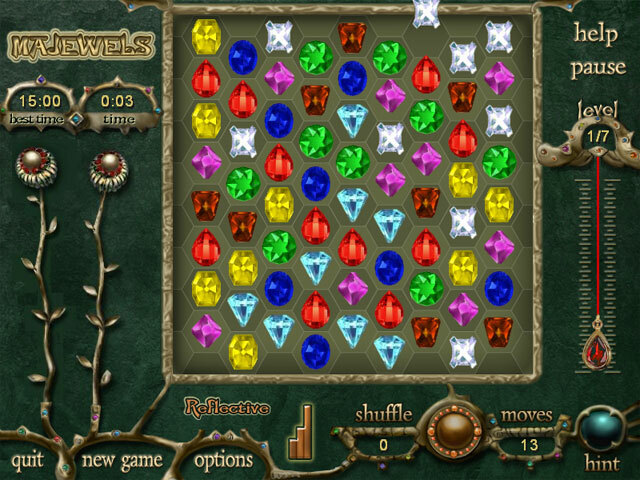 Swap jewels to align and remove them from the board. Look out for good and bad bonuses on your way and perfect your skill to select optimal strategy. Two boards are available – regular square board and innovative hexagonal, giving you incredible combinations. Game features simple mouse control, pleasant sounds and attractive gameplay. Two modes are available - Eager mode keeps you in pressure, while Reflective ensures calm and serene gameplay. Make sure the whole family can play and compete. Download Majewels The newest bestseller of stone-puzzle game with genuine HEX board. play, puzzle game, free, demo, download Bestseller of stone-puzzle game with genuine HEX board. There are regular square board and innovative hexagonal with incredible combinations. Eager mode keeps you in pressure, Reflective ensures calm gameplay. Whole family can play and compete!